The Study at The Huxley (Rendering courtesy of The Huxley). 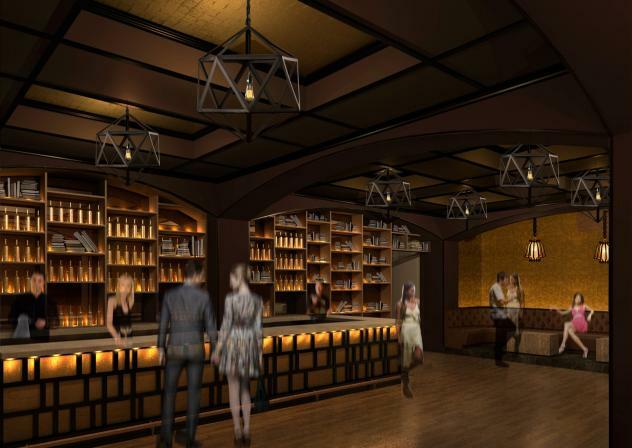 DUPONT CIRCLE -- In the footprint of a former television studio bordering Dupont Circle, owners Ryan Seelbach and Eric Lund will unveil a luxurious new 4,600-squarefoot club in mid-November called The Huxley. Literally designed from the ground up to �set a new standard for nightlight in [DC] with costumed performers, live musicians, celebrity DJs, and surprise entertainment�, the venue seeks to bring the latest innovations, service, and amenities that are commonplace in Las Vegas and New York but generally lacking in Washington establishments. 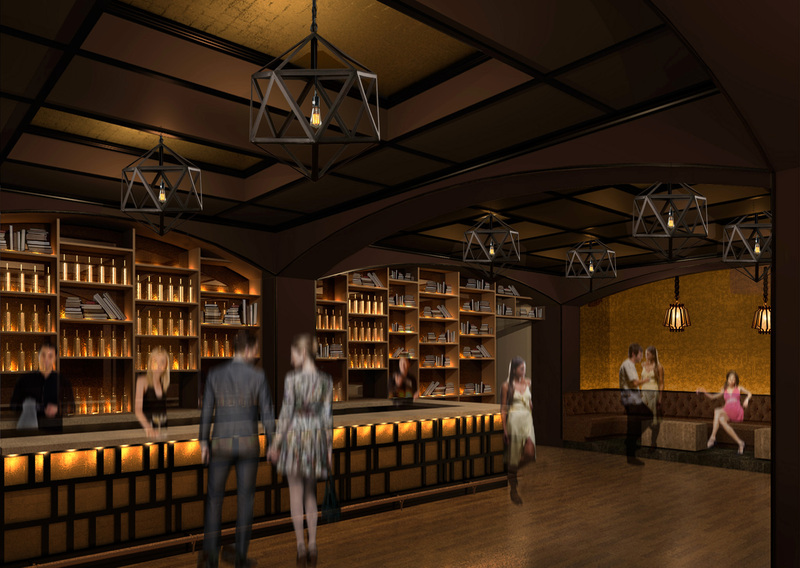 The Ballroom (Rendering courtesy of The Huxley). The Ballroom: A 200-person capacity space featuring rich red wall-coverings and mirrors aligned with purple velvet curtains designed to emulate the floor-to-ceiling windows found in traditional ballrooms. Eleven �bottle service� tables line the outskirts of the room with great sightlines of the raised DJ booth in the middle. And a stunning seven-foot gold plated chandelier, itself surrounded by smaller crystal chandeliers, commands attention at the center of the action. The Study: A cozy lounge that can accommodate up to 80 people, The Huxley�s secondary space provides an old world, library atmosphere, right down to the words of certain literary greats resting on the bookshelves. Six spacious and elevated table alcoves, each crowned with its own glass and copper lighting fixtures, surround the room for those seeking a more intimate experience. All the while, dark wood beams and beige wall coverings offer a rich contrast to the plush reds, purples, and gold framing The Ballroom. 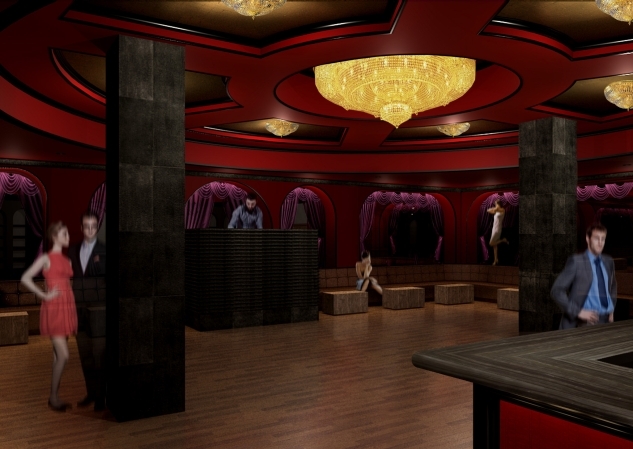 The Study will also boast its own sound system and DJ booth, which will be independent from the rest of the club. Lund should know what he�s talking about. As one of the top producers of nightlife events in the area, with more than 200 parties annually, his knowledge of the D.C. hospitality landscape is extensive. Joining Seelbach and Lund�s team, as General Manager of The Huxley, is Washington native Logan West. A George Washington University law school graduate, West used to be the General Manager at �list-only� Prospect Street restaurant and tavern George, where he helped make the hotspot a social scene staple amidst the Georgetown crowd. Success is rooted even in the design of The Huxley, with architects Brian Miller and Lauren Winter responsible for countless popular D.C. venues, including The Gibson, Marvin, The Brixton, and U Street Music Hall. The Huxley will be open 10:00 p.m. to 3:00 a.m. Fridays and Saturdays only, with a strict dress code. Admittance will be by guest list and table service alone. Those who wish to request a reservation must send a text message with their full names to 202-RESERVE (202-737-3783).